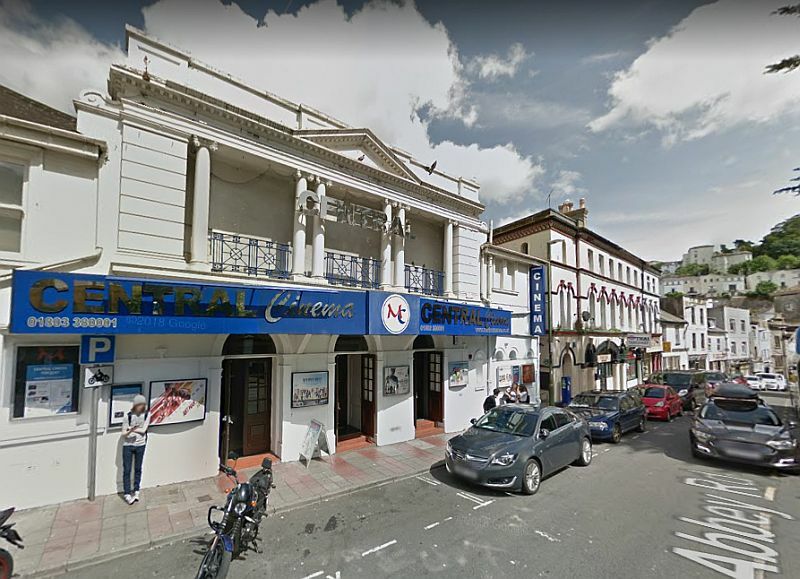 Above - A Google StreetView Image of the Central Cinema, Torquay, formerly the Theatre Royal - Click to Interact. 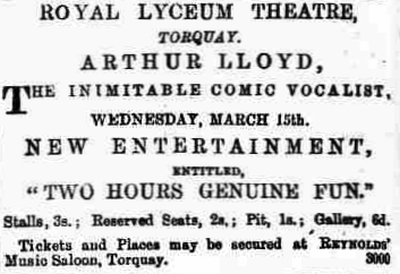 Right - An advertisement for Arthur Lloyd's tour of 'Two Hours Genuine Fun' playing at the Lyceum Theatre, Torquay on the 15th of March 1871 - From the Torquay Times and South Devon Advertiser, March 11th 1871. However, in 1879 the Theatre Architect C. J. Phipps was brought in to redesign the Theatre, which would eventually open on Monday the 12th of April 1880 as the Theatre Royal, after four months of rebuilding, with Planche's comedy 'Who's Your Friend', and Brough's burlesque of 'Masaniello'. Phipps had retained the outer walls and the roof of the original building but lowered the ground floor to get more height in the auditorium. The main entrance of the new Theatre was on Abbey Street but the Pit entrance was on Union Street, situated behind the Theatre. The Gallery and Ampitheatre entrances were situated on the steeply stepped lane beside the Theatre leading to Union Street. The South Devon Journal reported on the new Theatre in their 14th of April 1880 edition saying:- 'The energy and public spirit of one gentleman, Mr W. Gillow has at last provided Torquay with a theatre which will rank as second to none in the country. 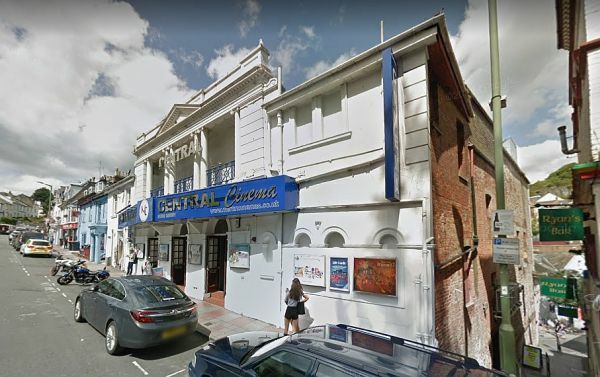 Left - The former Theatre Royal, Torquay, today the Central Cinema - Courtesy Görel Garlick. Mr Gillow, finding that the old building, known as the Royal Assembly Rooms was in the market secured it, with the aid of his friends [and] engaged the services of Mr C. J. Phipps FSA, architect of London, who has during the last 15 years erected no less than 25 theatres in various parts of the United Kingdom. Nothing of the old building remains, but the main outside walls and the roof. The entrances are so placed that each division of the audience has a separate doorway from three distinct streets. The stalls, private boxes, balcony and upper circle are entered from the Abbey Road by three doorways, protected by an overhanging glass awning projecting over the footway. The entrance to the pit is from Union Street and the pit is only six steps above the level of the street. The entrance to the amphitheatre and gallery is in the sloping lane leading from Union Street to the Abbey Road. 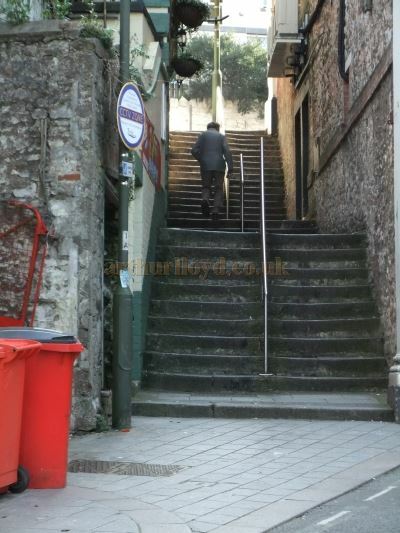 Right - The steeply stepped alley leading between Abbey Street and Lower Union Lane beside the former Theatre Royal, Torquay - Courtesy Görel Garlick. Note the former Gallery and Ampitheatre entrances in the middle of the alley. The auditory is divided as follows: Three rows of orchestra stalls holding fifty persons, having two private boxes, right and left, on the same level. The pit occupies the whole area of the ground level behind the stalls [with] accommodation for five to six hundred persons in comfortable seats with backs. On the first tiers, almost on the level with the Abbey Road is the balcony or dress circle in four rows [holding] about 100 persons in luxurious arm chairs from the architect's registered design. The upper circle has five rows of seats with backs for one hundred and twenty persons and upholstered. This tier is on the same slope as the balcony, only approached from the back corridor at the extreme top. On the 2nd tier is the amphitheatre or 1st row, in front of the gallery, and a spacious gallery behind. The walls of the auditory are covered by a rich crimson paper with patterns in gold. The ceiling is formed into an oval design, painted in an elaborate design of Romanesque character by Mr Edward Bell of London. The stage opening is 24 feet wide and the orchestra is partly concealed under the front of the stage. The above text in quotes (edited) was first published in the South Devon Journal, 14th of April 1880 and was kindly edited and sent in by Görel Garlick. The Theatre Royal had opened on Monday the 12th of April 1880 but by 1915 it had already had projection equipment installed for the showing of early films. Not much later, in 1922, a full time cinema licence was granted for a year. And by 1931 the writing was on the wall for the building as a live Theatre. It closed in November 1931 and was remodelled by Healy & Overbury as a full time Cinema, reopening on the 27th of March 1933 as the Royal Theatre. In 1935 the Theatre was taken over by Odeon Theatres Ltd., and in 1937 it was renamed Odeon. At this time there were apparently 571 stalls seats and 312 circle seats. In October 1973 the Theatre was closed and converted into a twin cinema, reopening on the 24th of March 1974 with one screen in the former stalls seating 360, and a second screen in the former circle seating 309. In 1999 the Theatre was closed and then taken over by the independent chain of Merlin Cinemas who reopened it as the Central Cinema in February 2000, now with three screens in the former stalls seating 122, 78 and 42, and a further screen in the former circle seating 308. 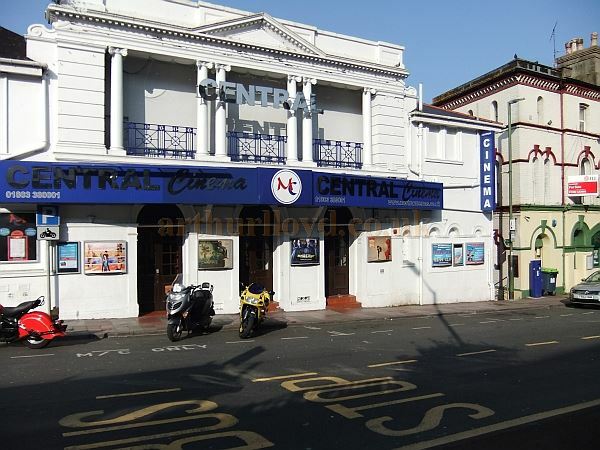 You may like to visit the Central Cinema's own website here. Some of the later information for this Theatre was gleaned from the excellent Cinema Treasures Website. Some earlier information was kindly sent in by Görel Garlick.